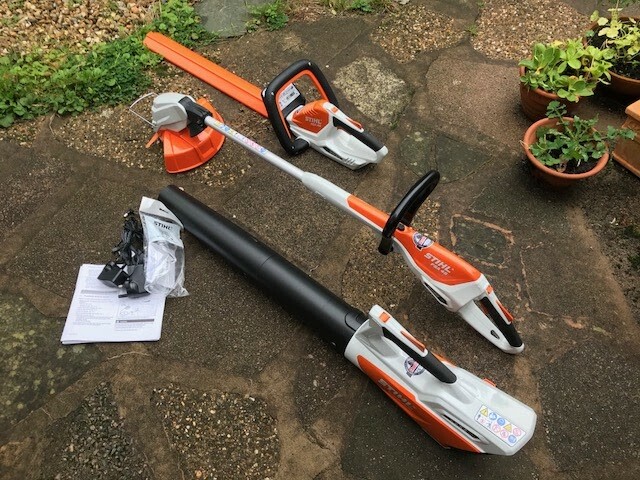 I think it is fair to say that I am very much a fan of Stihl products. I have reviewed products for them previously and genuinely think they are a high quality brand. The products below I was sent to trial so I have not paid for them but my opinions as ever remain my own. This review looks at three products I have recently been given to trial. Hang on a minute I hear you cry, you reviewed a grass trimmer for Stihl last year, what makes this one different? Well dear reader I shall explain. 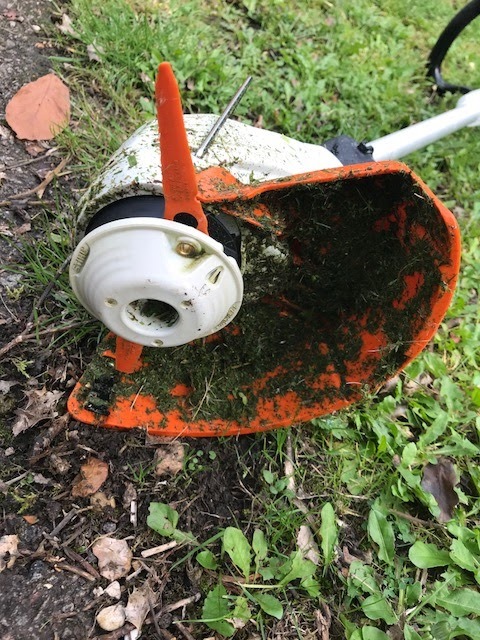 This is less grass trimmer, more brush cutter, and it has an integral Lithium-ion battery. It is a little lighter than the other trimmer and is also cheaper to buy. It might be cheaper to buy but it is no less a quality item. It has the same easy to read battery gauge that the other cordless products have. What I really liked about this trimmer was that it has plastic blades. Such was my excitement to try this I did not take a photo of it until I had already been using it for a while, so there is no pristine pre-use photo. This does show the plastic blades well. These blades are ideal for getting through some quite tough stems. 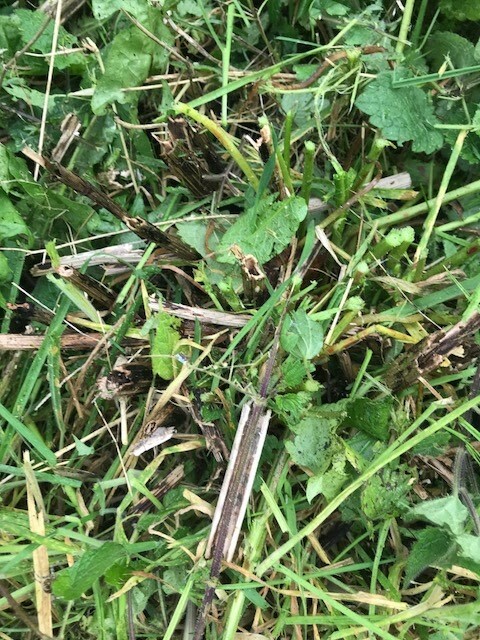 I think this shows quite well the type of weeds I was cutting with it. I was using it to clear the weedy patch in the driveway, which is mainly brambles and dock plants. I had huge fun cutting this area back. 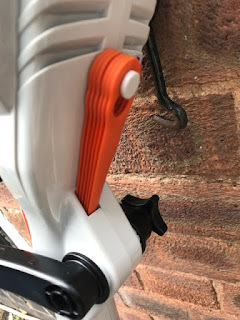 The spare blades are tucked into the handle and whilst I gave it quite hard test I did not need to replace either blad even though they were a little nicked by the end of the session, they were still effective. I must have been using it for a good thirty minutes and I did not drain the battery. This is a really effective piece of kit, it is perfect for the tough weeds I get in the parts of my garden I let grow a little wilder and I can very happily recommend it. I have never owned a leaf blower previously which is probably because I am a little lazy in removing leaves from the lawns /borders. 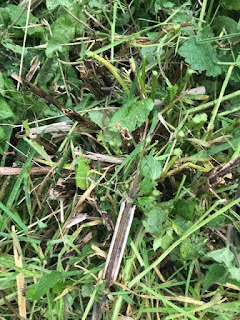 I tend to regard them in the borders as mulch and unless they are killing the grass underneath I sort of think that nature will deal with them on the lawns. I agreed to trial this blower largely because I have never used one and I wanted to know how useful it might be. I have no exciting photographs of leaves being blown about, I tried to think how I could do this effectively, but failed. The leaves did blow about rather pleasing way. This blower is as practical as it is fun. Again there is the Lithium-ion inbuilt battery and clear power gauge. It is very light to use, being only 2kg and has about ten minutes use time which is enough in a small garden situation I think (depends on how many leaves you have!) It took a moment or two to stop just randomly blowing the leaves about, I did then focus on that I was meant to be clearing them up. The leaf blower is extremely useful for clearing away leaves that are smothering the plants underneath. 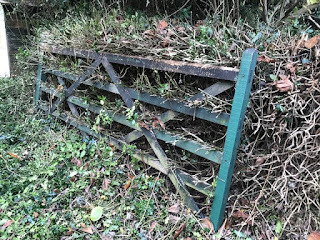 instead of moving them carefully by hand (which is what I usually do) I could just blow them to the back of the border - job done! I also used it quite a lot when tidying up from my hedge trimming exploits, which I will now detail below. This hedgetrimmer is described as being very light, at 2.3kg I can confirm it is delightfully light and therefore very easy to manoeuvre. They have the integrated battery which runs for around 40 minutes. I started off by trimming the lavender edges to the front garden. This hedgetrimmer is quite quiet, in fact I would say surprisingly quiet. This is good in that the noise of hedgetrimmers etc is enough to spoil a quiet afternoon for those who are not using them so I think my neighbours were grateful for less noise. 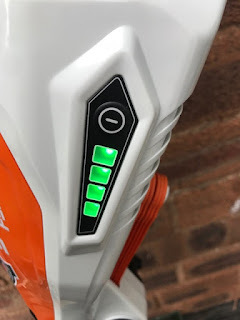 Whilst I know they are meant for small gardens, I wanted to be sure that quieter did not mean less power. I decided I needed a harder test. I set to on the holly hedge at the front of the garden. Yes you can see a gate buried in the hedge. 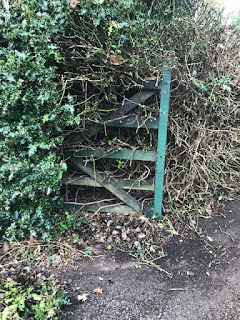 This is what happens if you lean a gate up against a hedge and then get a bit neglectful in hedge trimming. It was nice to see the gate again. 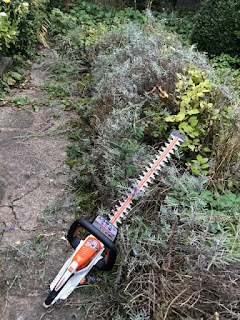 The hedge trimmer coped pretty well with this task. 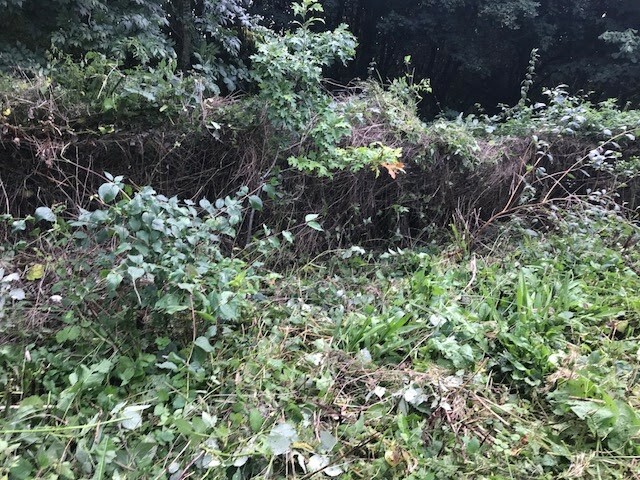 I will not mislead you, it needed some help as some of the stems were very thick and needed the chain saw to deal with them. The hedge trimmer did cope with stems around 1cm in diameter well. 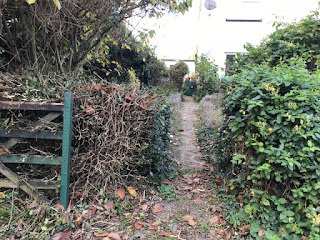 It turns out a holly hedge is not the easiest hedge to trim. The mess was incredible, each leave falls separately and so the leaf-blower was really useful in helping me tidy up. 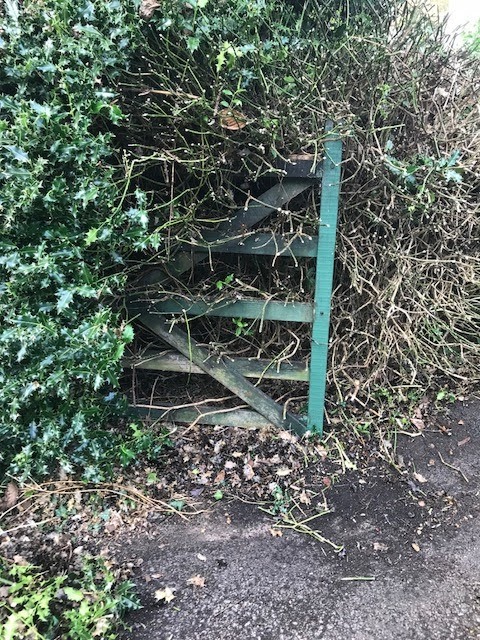 It took a couple of sessions to uncover the gate. 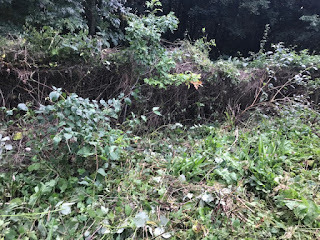 The hedge looks a bit massacred but it will recover. I just need to keep it under the control and trim it more frequently. Not only had it grown too wide but also too tall. I reduced the height by a good eighteen inches and it has opened up light into the front garden and made the entrance feel less closed in. I can happily recommend the hedge trimmer. It is perfect for a quick light trim on hedges that are not out of control. My top tip as ever with all cordless tools is to recharge after each use as then it will only need a quick zuzz to have it at full strength next time. This lightweight cordless range are a great price and fantastic quality, I thoroughly recommend them. Great Review, i want a cordless hedge trimmer and now I'm convinced! I love the noise it makes - almost like little shears. It’s great for a quick tidy up I think.